As you might have noticed, I don’t have a catchy title for this article. The fact is, I’m just too tired to bother thinking of one. I’m coming to the end of my time in eastern Ethiopia. Tomorrow I’m off to the south. One of the things that’s always great about coming here is that I meet people that are bigger and better than me in so many ways, and it really allows me to center both my perspectives and my priorities for the coming time. I met, photographed, and interviewed people this week who have been brought down to nothing and then miraculously restored. I’m met many people who have been beaten for their faith, and two who were attacked with swords. I met a man who was blind from birth until the age of 13, at which point someone prayed for him and he got his sight. I met a man who was freed from addiction issues and now sings to God with a beautiful voice about the ways he’s been saved. Many of these stories I will write about in the future, while some I may not? But what is the common thread that runs through all of these stories? Grace and restoration run through them all, and a desire to continually become more and more like the one in who’s image they have been created. When I Picked God For My Kickball Team. This blog is about missions, and about living a missional life. It’s also about photography, but not this time. The world is at a crossroads today; a turning point that has never been seen before, and a turning point that the church will either lead or fail miserably. The choice is entirely ours, but first we have to understand the choice. I’m going to skip around history today to try to connect the dots. Let’s start with the great commission, the last words Jesus said before he ascended into heaven. “Jesus came and spoke to them, saying, “All authority has been given to Me in heaven and on earth. Go therefore and make disciples of all the nations, baptizing them in the name of the Father and of the Son and of the Holy Spirit, teaching them to observe all things that I have commanded you; and I am with you always, even to the end of the age.” Many in the church seem to think this is optional today. We feel that the church is more about being on the right side of things; about defending territory that’s already won. In building on the last blog, many think openly that there is God’s team, and there is everybody else, especially Muslims. I am certain that many reading this blog feel that way. Let me go back to more than twelve centuries before the great commission. Joshua was about to lead his army into the promised land, and the attack on Jericho was coming close. A man (who turned out to be an angel) appeared in front of Joshua, and a very telling conversation happened. We have deluded ourselves today into thinking that God is on our side. I can assure you, He is not. The question is whether we are on His side. We are confusing God’s faithfulness with our own worthiness. The former is infinite. The latter doesn’t exist. It’s as if we think all the nations of the world got together for a kickball game, and we picked God on our team. God doesn’t play on our team. He is the whole game, and we exist for His glory, and not the other way around. We have deluded ourselves into thinking that He has blessed us with salvation because of something that we’ve done. The book of Romans is pretty explicit about this subject. “You see, at just the right time, when we were still powerless, Christ died for the ungodly. Very rarely will anyone die for a righteous person, though for a good person someone might possibly dare to die. But God demonstrates his own love for us in this: While we were still sinners, Christ died for us.” This takes away any idea that we are saved because of anything that we’ve done. We do what we do in the name of Christ because we have gratitude for what He did for us, and not because we fear we haven’t done enough. If we keep this attitude, the ideas of “Us” and “Them” suddenly disappear, and we realize that we are ALL fallen people, and we realize that we need to do what Jesus called us to do; to go to every part of the world and tell people what He did for us. Some preach, some teach, some do engage in humanitarian endeavors, some stay home to make it possible for others to go, and some use other skills. “What is in your hand?” is the question that God asked Moses. With that question, God used the staff that was in Moses hand to free his people. What is in your hand? This brings us to the turning point the world has come to. Islam has always been a violent religion. Few people with a knowledge of history will dispute this. Lately though, radicalization has become even more pronounced. I believe this is an indication of the devil working harder because of an imminent defeat. There are radical changes happening within the Muslim world. When we go into the Muslim world, we hear stories of Muslims having visions and dreams of Christ when they’ve never heard the gospel before. These are not unusual stories anymore. They are becoming more common. This is because the field is ready for harvest. The only reason Islam has had such a stranglehold on the area it has for the past fourteen hundred years is because of a control of information. The penalty for reading a bible in many places has been, and continues to be, as severe as having your right hand shredded, or even execution. We live in a world now where it is getting harder and harder to control information. I have seen where my blog is read, in places like Afghanistan, Saudi Arabia, Sudan, and many other places where a lot of the information I write is considered forbidden. This is a phenomenon that can’t be stopped. You can censor the internet, but you can’t do it completely. People who are questioning Islam now have access to the information that they never had before. The gospel is reaching the Muslim world, and the only one who can mess this up is……. The Church. The Muslim world can not only see the Gospel, they can also see your attitudes about them. Every time someone posts an article about how Syrian refugees should stay home, or how Muslims are on the losing side and God is on our side, we display our arrogance and self-righteousness and the idea that somehow we are more deserving of salvation than they are. God is currently spreading His redemption to places where it hasn’t existed in a long time. I would not personally want to be the person who stood in the way of that. To conclude, I’d like to quote a parable of Jesus. I’d also like to point out that these parables were written down because the writer knew they would continue to apply to us, and not so we could look back at people in history and look down on them. Let’s go ahead and be glad if the Muslim world is exalted in the end, but let’s not find that we had to be humbled in the process. 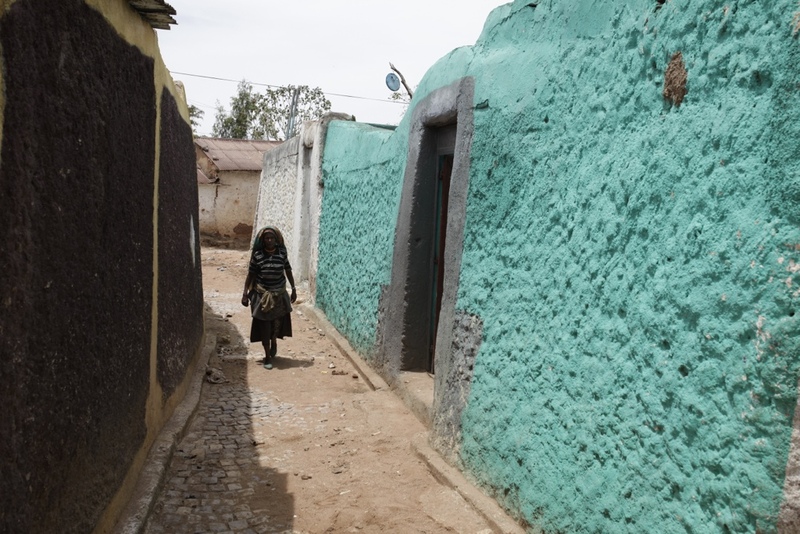 A woman walks down the street in Harar, Islam’s fourth holiest city.